Have you heard? 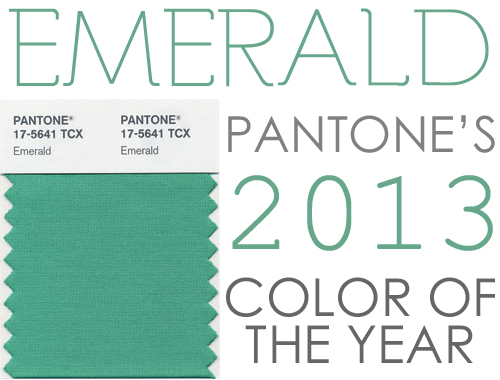 Emerald is Pantone's color of the year for 2013! This month at Homes.com I've written an article all about this fabulous shade, along with a few ways on how you can incorporating this lovely hue into different rooms in YOUR home this year! Head on over to read the full article. ...and don't worry, I haven't forgotten about the second makeup post, I'm working on it right now! I can't wait for the second make up post! I am horrible with it and the first helped so much!! oh i love this color! just bought sheets for our bedroom in this color! 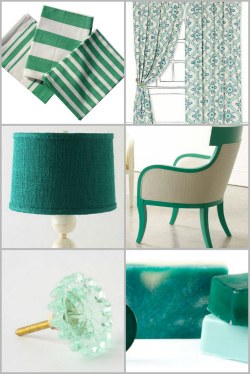 Great article:) I have had two emerald green vases that were my mother-in-law's on a shelf awaiting my favorite color to be #1. Still putting Christmas boxes in our attic,but already contemplating where best to display these charming emerald vases. I love color! I think this is a fresh look at emerald and I like it! Watching you on HGTV right now!!! Love you and you are so cute! I'm watching Clean Freaks on HGTV and I looked up from my computer and recognized the photo wall that I was seeing. And, I was like, "Hey! Wait! This lady blogs, I've read her blog!" Your house is absolutely beautiful, and your segment was amazing. I love this colour. It’s really an eye cooling one. I’m watching clean freaks on HGTV. I would love to know where the curtains are from in the pic you have posted. This is the curent color in my kitchen and those would look amazing!